Two months have passed from the Kretz release and it's time for a new EP coming from the Ukonx Recordings headquarters: this time the French label is releasing four new tracks by the Maltese project Sound Synthesis. Keith Farrugia started producing music with this moniker in 2009 on the Paul Blackford’s label Militant Science and after a seven years hiatus, he started again in 2018 releasing the "Acid Drive" single on Wirebox. Listening to the EP a couple of times gave me the impression that Keith had in mind a sort of theme and under this influence, he wrote tracks that have a similar structure: a thing which isn't bad per se but it popped out to my attention. 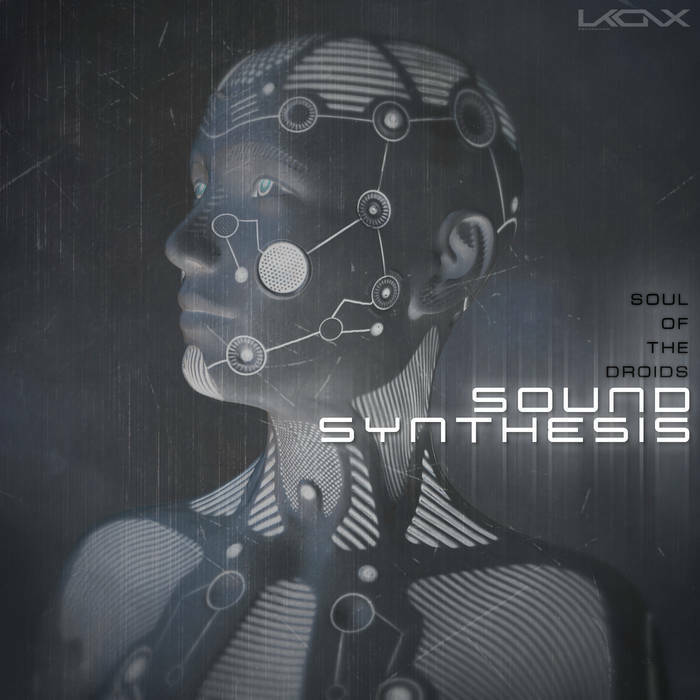 The EP opens with "Soul Of The Droids", a nice instrumental which mix dark atmospheres and 808 robotic beats. The following "Neurolink Cyborg" and "Electronic Slave" recall me a little a 2011 track made by Embryonik ‎titled "Space Cadet" and I like a lot the menacing detuned/filtered vocals mixed with the synth stabs that sound like coming from the deep space. For "Modulation", Sound Synthesis is teamed up by Datawave (Mechatronica, Crobot Muzik ) and the result is a bass synth driven powerful dark electro tune with a dance twist. Deemphasis' remix of "Neurolink Cyborg" closes the EP giving to the track a less dark and more robotic flavor. Paul LaBrecque, of Sunburned Hand Of The Man, and Ghazi Barakat, of Pharoah Chromium, have collaborated here to offer up two seventeen-minute pieces of nicely tripped-out post rock atmospheres that successfully sit somewhere between ambient and prog. First piece “Jajouka Pipe Dream” has, as the title may suggest, a slightly more Moroccan flavour, with ambling flutes and organic percussion. Everything ebbs and floats like a chaotic dream over a near-permanent grumbling percussive base. Second piece “Planet R-101”, again aptly titled, mostly foregoes these elements in favour of much more sci-fi waves of pulses and noises, over which there’s a gentle layer of occasional guitar plucking that’s just about the right amount of indulgence. Twelve minutes in there’s the return of a Moroccan-sounding melodic instrument which feels like a nice throwback to the first piece and ties it together well. It’s a deftly handled and nicely immersive short album that is marvellous to relax to. Hans Castrup’s third album for Karlrecords is, for the most part, a fairly familiar sounding landscape of dystopian and sinister drones and processed electro-acoustic noises that gives us a compact thirty-six minute ride of unsettling tones, dark sci-fi suspense and fear noises. It’s sonically diverse, melding together a variety of sources thoughtfully and very professionally, but from the opener “Cell Information” onwards, there is a niggling feeling of experimental-music-by-numbers that never quite shakes itself off. However the star element, that lifts it above the norm and gives it a more distinct character, is the introduction of Carla Worgull, who adds a variety of melodic vocalisations that span a variety of styles and moods. It’s sometimes operatic, sometimes theatrical, sometimes throat singing, sometimes a spontaneous exercise in small croaking (“Secret Of Fragmented Control”), and on the highlight track “Perfect Present” it sounds akin to a vocal impersonation of a 1950’s theremin (unless that actually is a theremin? I’m left not totally sure!). It’s a tightly woven collection of short pieces that works as a nicely structured abstract soundtrack, transporting you to alien environments, but for my personal taste I found myself wishing it had been more adventurous. To anyone acquainted with the more ethereal side of electronic music, the name Craig Padilla should certainly be familiar. He has quite a large catalogue of releases going all the way back to 1990. The last thing I heard from him and reviewed here was his 2017 collaboration with Howard Givens, 'Being of Light,' an absolutely splendid ambient work. Padilla has been known to partner-up with some great collaborators over the years, and this one with guitarist Marvin Allen is no exception. If you could imagine Pink Floyd's Dave Gilmour working with Tangerine Dream, that might give some clue to the music you could expect on 'Toward The Horizon'. It is expansive space music with some space rock overtones, soaring well above the stratosphere into regions you've only dreamed of visiting. The album opens deceptively with some texturally rich languid chords from Allen's guitar echoing around, suffused with Padilla's synthmosphere, and you figure this is just going to be one floaty, placid trip. Then the sequencer sneaks in, and now we have a rhythm going. Allen's guitar takes flight and suddenly it's "whoa! I've got to crank this mother up!" Everything's cookin', everything's groovin', this is what I came here for. This is the rocket ride we’ve been longing to take! At over 17 minutes the title track of this album is still too brief. It could have gone on for 30. Hell of an opener though; got my attention. Padilla conjures some gentle but heady ethereal atmosphere in "Distant Waves," and Allen's guitar sonics are way more expansive than what you'd expect from a guitar. Things are comparatively more tempestuous on "Tidal Disruption" (another long track at 13 minutes) at first, until the rhythmic sequerncer kicks in, with Allen's guitar skirting the nether regions. Then it begins to rock, and I mean ROCK! This ain't no new age nonsense, this is SPACE ROCK baby and I'm all in! Once again, this track could have gone on for 30 minutes and I'd still be digging it. It does mellow out before it finally concludes, but that's as it should be. Somehow Padilla and Allen's sounds work very well together, almost as if they've known each other for years and years, which they actually have. The depth of the environment of "Beneath The Surface" is simply breathtaking in its boundless cosmic vibrancy, where layer upon layers gives you the aura of the infinite. Seriously, this is beyond huge, and the changes over time are simply sublime. I wasn't so sure about "Hidden," which opens with an organy-harmonium like pad that didn't seem in keeping with what I had heard so far. That didn't last long though before giving way to burbling synths and galactic guitar. Man, that guitar sound is vast and humungous, like something conjured up from the primordial ooze. It's quite a contrast with Padilla's delicate synthwork, and that's what makes it fit together so well here. The last track, "Liquid Heaven" lives up to its name but lacks the impact of anything that went before it. As it is the shortest track on the album at 4:35, you can just consider it a chiller to cushion your reentry to terra firma. I understand this is Marvin Allen's first foray into the world of ambient, but he acquits himself admirably on ‘Toward The Horizon’ as if he were a master in the genre. I'd be game for another team-up with this dynamic duo if they were so inclined; perhaps something even more space rock oriented and less ambient. (I know there's a market for it.) In the meantime this is a worthy and highly recommended effort.